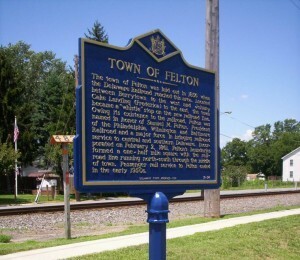 The town of Felton was laid out in 1856 when the Delaware Railroad reached this area. Located between Berrytown to the west and Johnny Cake Landing (Frederica) to the east, the town became a “whistle” stop on the new railroad line. Owing its existence to the railroad, Felton was named in honor of Samuel M. Felton, President of the Philadelphia, Wilmington and Baltimore Railroad and a major force in bringing railroad service to central and southern Delaware. Incorporated on February 2, 1861, Felton’s boundaries formed a one-half mile square with the railroad line running north-south throught the middle of town. Passenger rail service to Felton ended in the early 1950’s. This marker tells a brief history of The Town Felton when the railroad reached the area.